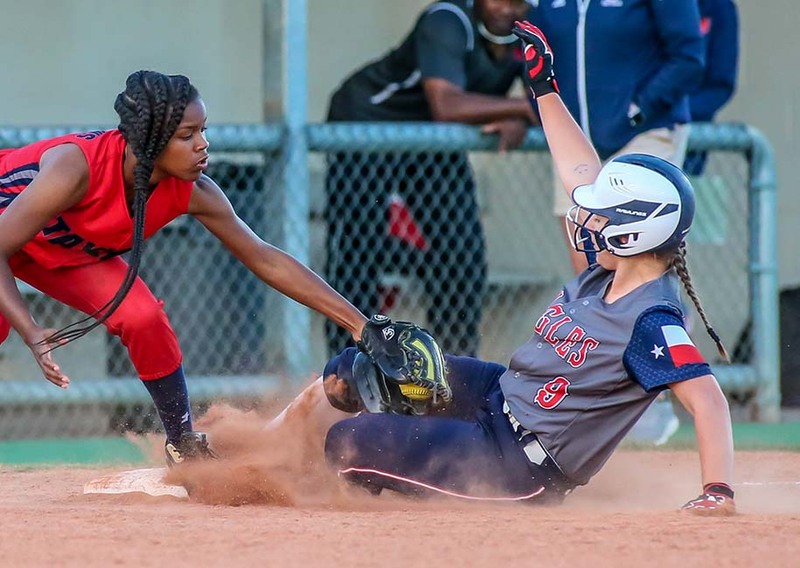 SAFE AT THIRD - Dawson senior Giavanna Gardella (9) slides under the tag at third base against the Alief Hastings Lady Bears. Gardella scored two runs and had one RBI in the game. The Lady Eagles won 17-0 in three innings and finished district tied for the league championship at 11-1 with Brazoswood. PEARLAND — It was a one-game playoff for the No. 1 seed entering the post-season and the Dawson Lady Eagles got a 4-1 win over district rival Brazoswood who shared the league title with the Lady Eagles as both teams finished 11-1 which prompted the head-to-head confrontation. Dawson set the tone for the outcome of the game with a three-run first inning. The 3-0 was enough to win the game as Brazoswood was only able to get one run off of junior pitcher Courtney Day in the top of the fifth to narrow the lead to 3-1. But the Lady Eagles added an insurance run in the bottom of the sixth to make the final score 4-1. The first inning was the deciding factor as Kirsten Williams led off with a single to left field. Peyton Ellermann sent Williams to second on a sacrifice bunt. Courtney Day was walked putting two runners on base with one out. Izzy Richey strokes a single to right field sending Williams across the pay station for the game's first run 1-0 while Day's pinch runner Allegra Trevino moved to third. After Richey steals second, Trevino was able to steal home to make the score 2-0. Kyra Lunford gave the Lady Eagles the third run of the inning when she blasted a double to centerfield that brought Richey home for a 3-0 advantage. Richey scored again after she singled in the sixth inning and scored on a single by Lunford to make the final score 4-1. Richey was 2-for-2 with two runs scored and one RBI while Lunford was 2-for-3 with two RBIs. Day was the winning pitcher after pitching seven innings while allowing seven hits, one earned run, and striking out six with two walks.